Air New Zealand reported a 75 percent rise in half year net profit to $98 million, as passenger numbers, cargo volumes and yields all increased from a year earlier. Revenue for the six months to the end of December was 9 percent higher than a year earlier at $2.26 billion. Air New Zealand's seats to suit trans tasman offering has had a better than expected response from the travelling public. Although Air New Zealand will tweak the leg room in part of the cabin to meet the needs of their high-value customers. Chief financial officer Rob McDonald said the airline was taking out half a row and would increase seat pitch on one side of the plane back to the exit row to give a 33 to 34-inch pitch. "That's probably the biggest feedback we've had from high-value customers, the absence of those seats," he said, noting that the more spacious seats would start reappearing next month. I saw one of the new Virgin uniforms in the flesh today (a perk of working 100m up the road from VB HQ) It is the female uniform as modeled by the girls in the middle of the photo below. The red is a lot redder than the pic below makes out. I am yet to see the male uniform, but from what I have seen of the female uniform it looks good. Qantas have put out a press release with an announcement on an increase in fleet numbers. This takes Qantas to a total of 33 737-800s on order. An interesting opinion piece on the fortunes of Qantas CEO Alan Joyce has been published in the Australian. IF there were ever any nagging doubts that the affable Irishman running the nation's flagship airline could play tough, they have been well and truly put to rest in a matter of weeks. The piece goes onto list the fortunes and resolve of the CEO in the face of profit forecasts, the upcoming assault by Virgin, and other factors in the industry. It appears to paint Joyce in a good light, placing him as a tough operator whose hardline and strength is helping Qantas in the tough times. Virgin have shrugged off the preemptive strike from Qantas as a sign its struggling, while industry observers have described it as an attempt by Qantas to make life hard for Virgin. Virgin will soon introduce Airbus A330s to their fleet to operate on Perth <--> East Coast services, and Qantas have announced that they will introduce an international configured 747-400 to SYD <--> Perth flights as well as A330s to their MEL/BNE <--> Perth flights. Virgin Blue have introduced two new logo jets recently. 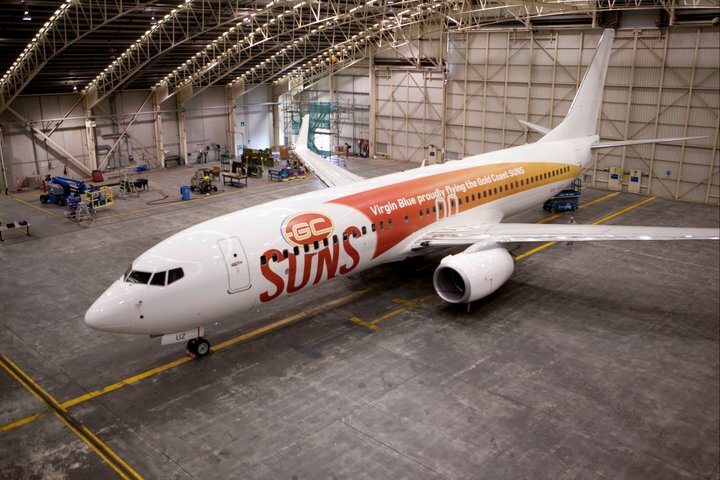 These promote their new agreement with the AFL as the official airline of the AFL, and also their sponsorship of the new team the Gold Coast Suns. It also serves as a way of making their newly delivered all white aircraft less boring. Virgin aircraft are currently being delivered in an all white scheme until the announcement of the new livery that will accompany the rebranding of the virgin group, as they look to refocus their brand. Air New Zealand have announced they will increase services to China during the northern winter. The airline said today that it would be adding an Auckland-Beijing return service from December 6 and an Auckland-Shanghai return service during the peak summer season from December 11 to March 18 2012. This will increase Air New Zealand flights to China to a daily service 3x Beijing and 4x Shanghai. They have announced this on the back of an increase of 20% in visitor numbers from China. But some armchair pundits on the internet will not be happy with this, as this increase is generally in tour groups that fly discount economy, and not the premium seats in which ANZ make their profits on each route. But if it is working for Air New Zealand and as long as they dont loose money on the routes, I am all for them increasing to a daily service to China. Air National seem to be having some serious woes lately with the NZCAA. The CAA has continued the current grounding of the airline, for another two weeks, while they continue to investigate multiple breaches of safety guidelines and aviation law. The CAA is so concerned with the operations of Air National they have publicly labeled them NZs highest risk airline operator. Air National – New Zealand’s largest charter airline and currently grounded for safety reasons – has been revealed as the country’s highest risk airline operator. Air National operates a fleet of charter aircraft, the most notable being the Jetstream J32s which regularly operate Air New Zealand Link services on charter to the national carrier, and subsidiary Eagle Air. They also operate a BAe 146 in 84 seat configuration. Thanks to fellow blogger Steve (3rd Level New Zealand) for his link to the first article which introduced me to the depth of the problems with Air National, and as Steve points out, the comments on the 1st article are a story in themselves. The relatively new player in the scheduled services market in Australia, Strategic Airlines has announced another new domestic Australian route, in keeping with their current domestic services aimed at the booming resources sector. The new routing is Brisbane to Gladstone, and will operate double daily flights weekdays with a morning and afternoon rotation BNE-GLT-BNE. The flight will be operated by one of the company's Airbus A320 aircraft, offering 8 business and 144 economy class seats. Qantas has upped the anti on the domestic east coast - west coast flights with an announcement aiming to pre-empt the service/capacity increase of rival Virgin Blue. Qantas have announced aircraft in full international configuration, 747-400s and A330s will operate the cross continent flights. The 747 will operate SYD-PER flights while the A330s will increase their services on MEL-PER and BNE-PER flights. Virgin Blue have also got A330s arriving shortly that will operate on trans-continental flights from the east coast to Perth. To me this announcement shows just how much impact the "new" Virgin Blue under the guidance of John Borghetti is a worry to Qantas and Alan Joyce. But of course this has a positive side to it, with travelers now able to enjoy larger more comfortable aircraft on the long trans-continental flights, and not be cramped up on a 737. Qantas have announced that from 25-February-2011 that trans-tasman and domestic fares will rise by 5% due to the rising costs of aviation fuel. Once again Woodbourne became the scene of drama today when another Air Nelson Q300 on a flight from Hamilton to Wellington diverted due to a nose wheel failure. The plane landed safely and all on board escaped without injury, but it will require some repair work to get operational again.